Our conference hall seats about 40 persons and is fully equipped for modern presentations. In addition to the main hall, several group-meeting rooms are also available. 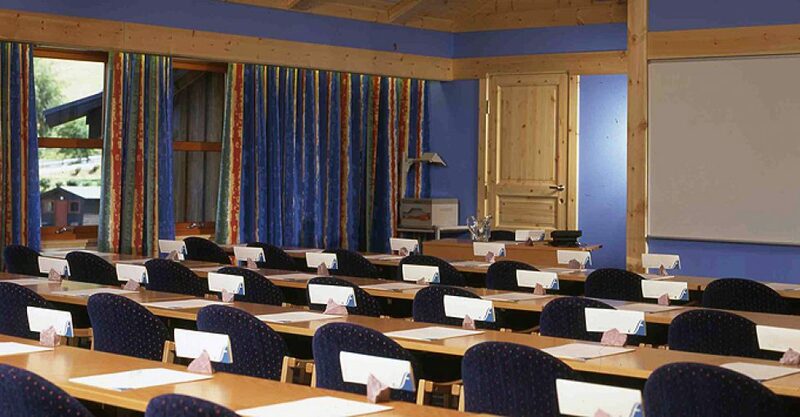 Meetings and conferences can easily be combined here in Lom with fun adventures in Lom and Jotunheimen. There are also a number of popular attractions in the centre of town, such as Lom Stave Church, Norwegian Mountain Museum, Fossheim Stone Centre and the Norwegian Village Museum. From the hotel it is easy to choose among a range of short walks and more demanding hikes along nature trails or to the majestic Lomseggen (narrow mountain ridge). Other alternatives include day-trips to Galdhøppiggen, summer skiing at Galdhøpiggen Summer Ski Centre and glacier crossing and canyoning in Dumdalen. The company Naturopplevingar AS in Lom offers trained staff and all the necessary equipment for short or long guided trips year-round.